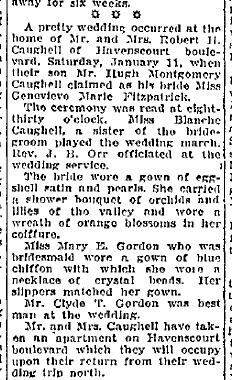 It describes the wedding of my Grandmother’s cousin, Genevieve Burke, to Hugh Caughell. Genevieve was the daughter of John “Jack” Burke and Gertrude Jones (Gertrude was my Great Grandmother’s Sister). The wedding took place in the home of Hugh Caughell’s parents on Havenscourt Blvd. I am assuming that’s in Oakland. There is something peculiar about this announcement. Genevieve is listed as “Miss Genevieve Marie Fitzpatrick”. I don’t know where the heck the Fitzpatrick came in! Also, while Hugh’s family is mentioned, Genevieve’s is not. The Fitzpatrick is probably a mistake. If it had said “Mrs.” I would really be wondering! The couple was going to take a trip up north for their honeymoon. Then it was home to their new apartment. I did a search for Rev. J. B. Orr on the web. In the 1915 City Directory for Oakland he is listed as the Pastor of the Myrtle Congregational Church on Myrtle Street. I wonder why the couple was married at the Caughell’s residence rather than at church? Given the fact that the wedding was written about in the newspaper, I don’t think this was a rush affair or that they were poor. I would need to find out more about the family and about practices in 1930. Maybe the Depression had something do to with the “at home” ceremony. I now have the wedding date for this couple and a description of the affair for my record books.